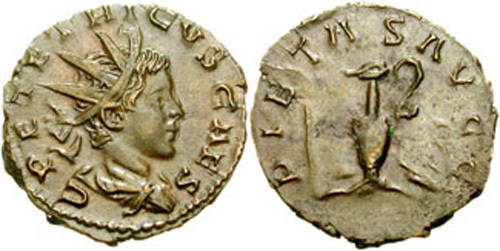 C. Pius Tetricus, son of Tetricus Ist was given the rank of Caesar at the same time of his father's accession and, following the abdication of the latter, his life was spared by Aurelian and he spent the rest of his days as a private citizen. Reverse: LAETITIA AVG N, Laetitia standing left, holding wreath and anchor. 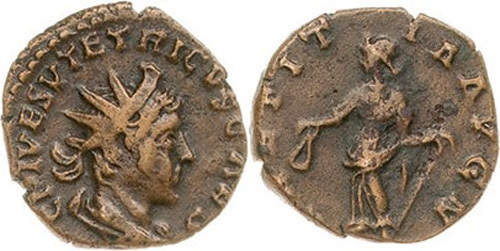 Obverse: C P E TETRICVS CAES, Radiate, draped bust right. 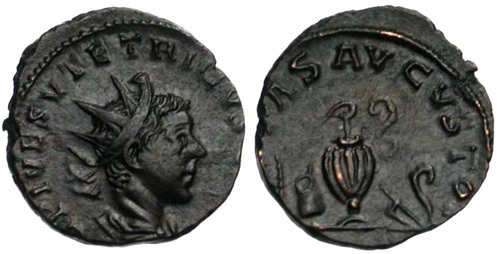 Reverse: PIETAS AVGG, Emblems of the pontificate: aspergillum, simpulum, capis, secespita, and lituus. 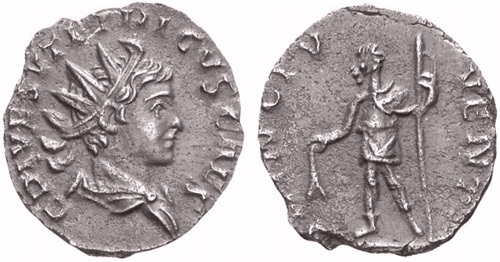 Reverse: PIETAS AVGVSTOR, Emblems of the pontificate: aspergillum, simpulum, capis, secespita, and lituus. Obverse: C P E TETRICVS CAES, Radiate and draped but right. 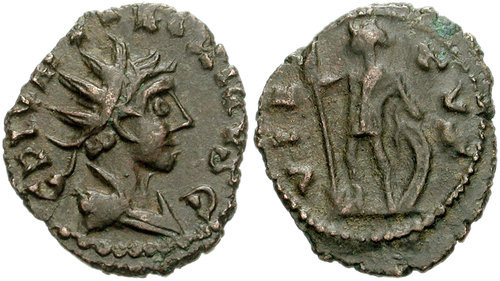 Reverse: PRINC IVVENT, Caesar standing left, holding branch and sceptre. Reverse: SPES AVGG, Spes advancing left, holding flower in right hand and raising robe with left. Obverse: C PIV ESV TETRICVS CAES, Radiate, draped bust left. Reverse: SPES PVBLICA, Spes advancing left, holding flower and lifting hem of dress. Obverse: C PIV ESV TETRICVS G, Radiate, draped bust right. Reverse: VIRTVS, Soldier standing left, leaning on shield with left hand and holding spear in right hand.